The Mitsunobu reaction is an SN2 nucleophilic substitution on a primary or secondary alcohol. It allows to replace the hydroxyl group −OH with a great variety of functional group, depending on the selected nucleophile. The most common products obtainable thanks this reaction are esters, thioesters, thiols, halogen derivatives etc. The nucleophile requires: 1) weak acidity 2) electric neutrality. We will understand much more easily considering the reaction mechanism. where HX doesn't indicate an hydrogen halide but a generic nucleophile weakly acid suitable to lead the reaction. I.e → fenols, carboxylic acid, thiols etc. 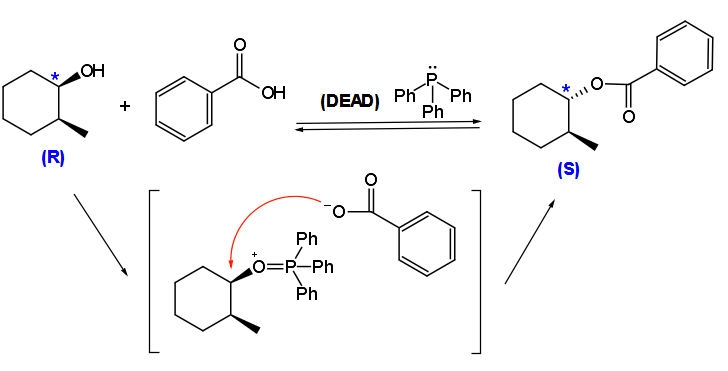 Best reagents to perform the Mitsunobu reaction are: DEAD (diethyl-azo-dicarboxylate) and triphenyl phosphine (in addition obviously to the alcohol and the nucleophile). Apparently the reaction is quite complicated but actually is simple, following few logical steps. 1) Trimehtyl phosphine acts as a nucleophile on one of nitrogen atoms of the -azo group. We are used deal with the nitrogen as a nucleophile whereas in this particularl condition (azo group adjacent to a carbonyl) behaves as an electrophile. The electron pair transfer by the phosphorous leads to the movement of π electrons on the adjacent nitrogen atom, that is now negatively charged. Besides, phosphorous is positively charged (phosphonium). 2) Nitrogen is protonated by the nucleophile (remember that is a weak acid as well). 3) Phosphonium is an electrophile center. Is attacked by the alcohol and the result is a positively charged (at the oxygen) intermediate. Then the intermediate eliminates hydrazine that in acid environment gives a dark precipitate. Triphenyl phosphine oxide((Ph)3PO) is a good leaving group (similar to phosphoric acid) indeed thanks the action of the nucleophile (X-) we can finally obtain, through pure SN2, the functional group of interest. (Ph)3PO is easy to remove because is a solid residue, however sometimes is still necessary to purify the product. Notice that the reaction is actually a condensation (H from acid/nucleophile and OH from the alcohol) and that to "expel" just one water molecule lots of by-products are needed. From the atomic balance point of view the reaction looks not so efficient and complicated, but the advantages justify the process. Our substrate (alcohol) is a 2-methyl cyclohexanol, with absolute configuration R. The nucleophile is a phenol (we have to remember that aromatic alcohols are more acids than correspondent aliphatic alcohols). Therefore the phenol is what we pointed as HX previously. The reaction product is an ether. Notice that an extremely important consequence of Mitsunobu reaction is the inversion of configuration (even if in the "starting" alcohol there are two chiral centers we are interest just in the one that undergoes the substitution), in other words is stereospecific. The reaction gives a single enantiomer. Is unbelievably useful, mainly because there are lot of natural origin alcohols enantiomerically pure. This second example is maybe even more interesting than the previous one from an applicative point of view. We can do this because the last intermediate shows a positive charge on oxigen and then is a particularly activatted electrophile. There's anything new in this particularl reaction, which takes place with the same intermediates and the same kind of stereoselectivity. Considering we have used the carboxylate the product insn't an ether but an ester. Now, just hydrolising the ester in acid environment I can obtain the starting alcohol but with the opposite stereochemistry (configuration switch from R to S). In other words I can take a specific alcohol with a specific configuration and with a simple reaction (doesn't give so many problems) I can easily obtain its enantiomer. This configuration swap is made possible only because the reaction takes place with an SN2 mechanism. Notwithstanding the Mitsunobu reaction is widely used, because of the stereoselectivity (stereoselective reaction are very appreciated), relatively mild conditions and the possibility to synthesize a wide class of products( ethers, esters, lactones, lactams, thioesters etc.). In addition, hardly ever we have elimination by-products (double bonds), rather common instead in other nucleophilic substitution reaction.